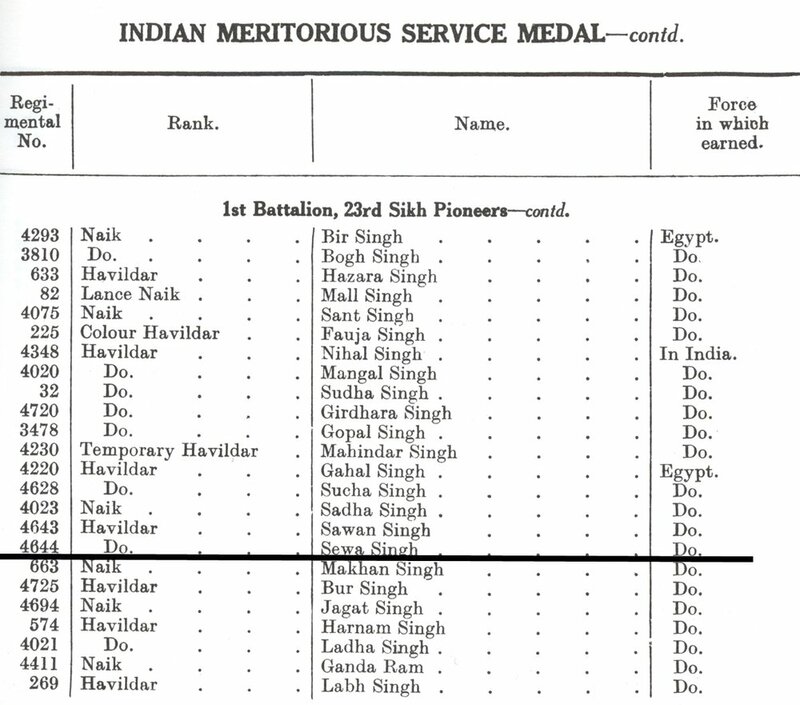 A Havildar in the 1st Battalion of the 23rd Sikh Pioneers. He was battling in the front line during the Sinai and Palestine Campaign when he received a poignant postcard from his daughter Kishan Devi. His life has been researched by Citizen Historian Avtar Singh Bahra who owns the postcard. At present, nothing is known about Kishan Devi and Sewa Singh before the war. The 23rd Sikh Pioneers were part of the Indian Expeditionary Force E and consisted of the 22nd (Lucknow) Brigade sent to Egypt in October 1914. While battling in the front line during the Sinai and Palestine Campaign as part of the Indian Expeditionary Force ‘E’, Sepoy Sewa Singh received a deeply moving postcard from his daughter, Kishan Devi (and it also included a message from her mother). Postmarked 7 February 1916, this incredibly rare postcard penned in Punjabi in the Gurmukhi script is possibly the only surviving example of its kind. I do not fight with anyone. My heart is yours. You are my everything, and I worry about you. Without you I am like a living dead. I am unable to live like this, even though you give me a lot of assurance. This letter is sent to you on 22nd day of month of Magh [runs from January to February], English date is the 5th [of February]. Mother bows to you with hands clasped. Dear father we do not have another envelope [ie a postcard to write on]. Dear father please take leave and come to meet us. Please do come! We repeat again and again. Reply to our letter soon. It speaks of the links between the home front and the war front, of the love of a daughter for her father, and of the social structures within a rural Punjabi family a century ago. Sewa Singh was awarded the Indian Meritorious Service Medal (IMSM) for Egypt and subsequently promoted to the junior rank of Havildar. At present, nothing is known about Kishan Devi and Sewa Singh after the war. The Royal Mail included Kishan Devi's moving WW1 postcard as part of their 500 years commemoration. This incredibly rare card was in the collection of British collector Avtar Singh Bahra and became a highlight of our 2014 exhibition at the Brunei Gallery. Since then it has been utilised in a number of other WW1 projects culminating with the Royal Mail's 500 years of postal history in 500 items. With nearly two-thirds of India’s recruits coming from Punjab, the impact on families across the region was profound. Aggressive recruiting campaigns saw one in every seven Sikh men of fighting age head for the battlefront. In their absence, their wives were often left to single-handedly deal with the domestic consequences of war: rapidly rising grain prices, lack of basic medicines, the devastating impact of disease outbreaks and, for many, the consequences of widowhood. An image of a young Sikh mother and her child photographed by an English eye surgeon in Amritsar in 1911 has been included in the gallery at the top of the page. It illustrates a most wonderful piece of literature concerning our theme. watching the anxiety in their eyes I told them how, when I had visited Indian soldiers in Hospital in England, I had found that their talk to me was always of their homes in India, their children, their mothers, and their wives. The next day the menfolk told me that that had greatly comforted the women, who feared lest the men should take European wives and forget them.